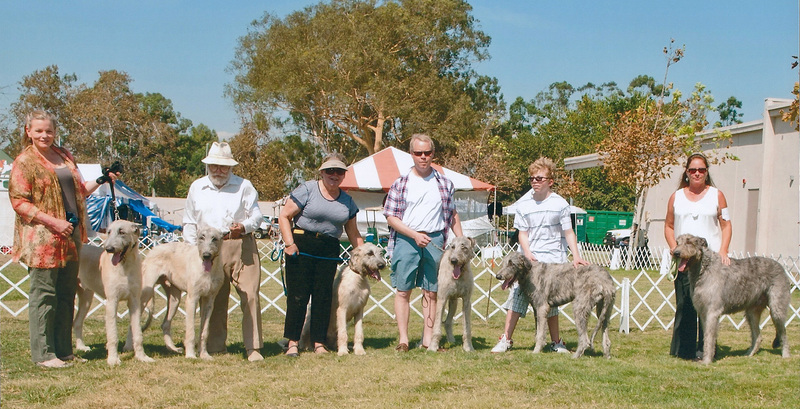 October 27-28 Riverside Kennel Club show, Lake Perris. I will be there Stewarding and would LOVE to see some of our "family" exhibiting. Call for information. Nov. 23-24-25 TURKEY RUN--The big annual Lure Coursing event for our area. Great time to come out and give your puppies and young adults a chance at this exciting sport!! Contact dixie@sunstag.org to be included on the mailing list. Start practicing your puppies now to enhance their prey drive. December PPD--Puppy Play Date. (No Date Yet Scheduled) Perhaps we could hold a New Year's celebration a bit early...like Sunday 12/20? Anyone interested, please call. Puppy Play Dates with Finger Foods for Humans; Cookies for Hounds. AW COME ON DAD! What We're All About! Send us your favorite photo (preferably by eMail dixie@sunstag.org and we'll highlight your special hound in this on-going section. Jim Greco with 13-week old Chief. Cindy/Finley (Great Uncle-3 times removed, Keller King Fizel). Happy 11th Birthday, Chauncy! 2010.
just shy of his 13th birthday 2012. Till we meet again. Almost run-away FUN!!! Get the plastic bunny!! COME TRY TURKEY RUN IN NOVEMBER! ...from Germany to The www.Turrean.org Home. ON THE NEW CHAMPION STATUS! YEAH! And, thank you to our handler, Michelle! Come one! Come all! 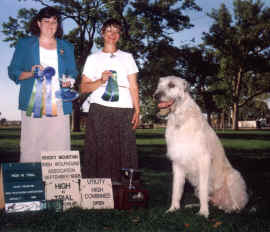 The Irish Wolfhound Association of the West Coast Specialty will be held again on the last weekend of July 2013, Thursday-Friday, at Ryon Park in Lompoc, California. 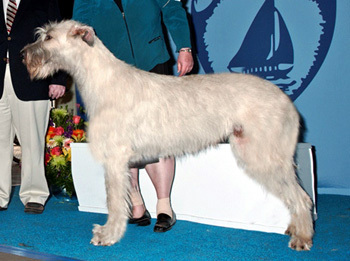 The Specialty will be followed by Lompoc Valley Kennel Club all-breed shows Saturday and Sunday of that weekend. Don't be left out. 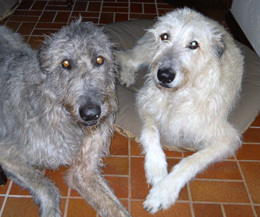 Contact dixie@sunstag.org to be on the Mailing List for other Irish Wolfhound events. for further details and upcoming activities not yet listed.